Sometimes I feel like the queen of boring recipes. But, like this chicken, they all seem to have their place in our meal rotations around here. I love taking a simple recipe & perfecting it. I like it when I feel like a recipe is foolproof-- that way I can make it in a pinch & not think twice (or wonder if it's going to be cooked through or not). This chicken is juicy, tender, and cooked to perfection. It's an easy addition to so many meals: salads, pasta dishes (like my Paleo Chicken Alfredo Pasta), wraps, etc. Plus, it saves really well-- so is great for lunches throughout the week! 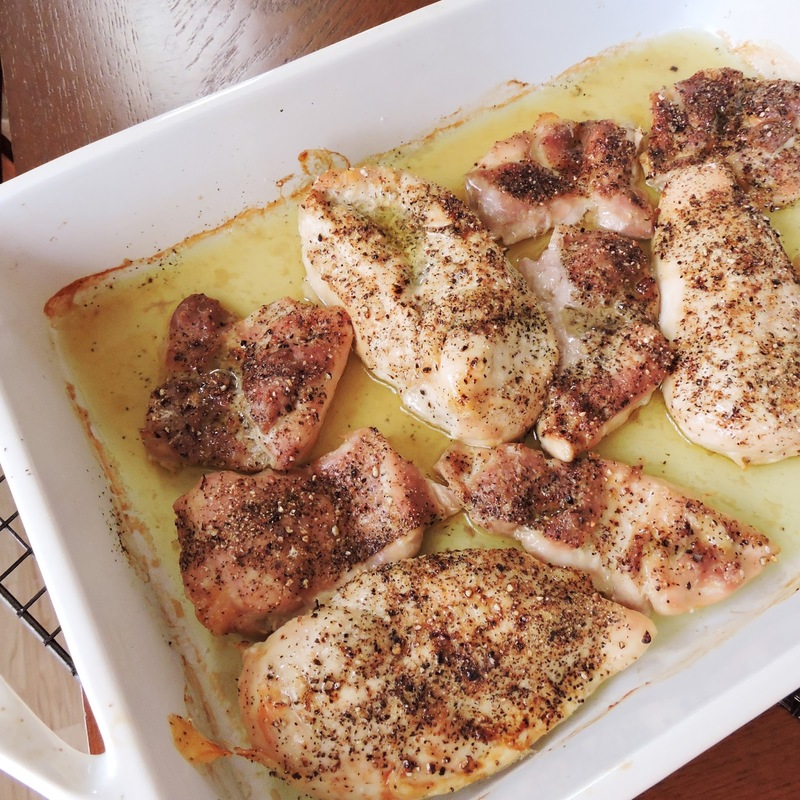 Here's my how-to with a few tips for my favorite, go-to recipe for classic baked chicken. I hope you enjoy it! Drizzle olive oil in the bottom of a baking dish or roasting pan (just enough for a light coating). Pat the chicken pieces dry with paper towels, then place them in the baking dish (skin side up if they have skin!). 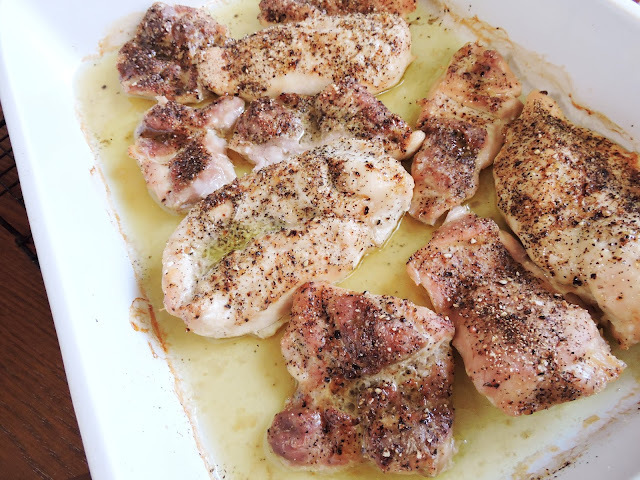 Lightly drizzle the tops of the chicken with olive oil, and sprinkle with salt & pepper, and any other spices you like. I use a lot of black pepper! Bake at 400ºF for 30 minutes to get the browning going, then reduce the oven heat to 350ºF. Bake for 10 to 30 more minutes, depending on your oven & how much chicken you use, until the juice run clear with no pink when you poke the chicken. Turn on the broiler for the last 4-5 minutes for extra browning on top! Remove from the chicken from the oven, and let it rest for at least 5 minutes before cutting & serving. 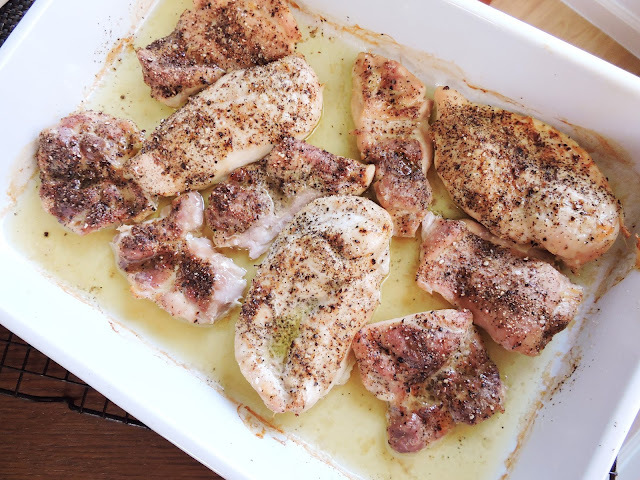 Tip: I find that cutting the chicken in the pan with its juices (or at least returning it back to the juices after cutting) makes it extra tender & moist! Just drain it before you store the leftovers. Enjoy on a salad, in a wrap, or as a main dish with whatever sides you like! It saves really well for great lunches!